No matter how proficient you are with OS X and the apps you use, there will still be moments when you need a helping hand. The quickest way to find out how to accomplish a task is to get help; the kind that’s included with OS X. 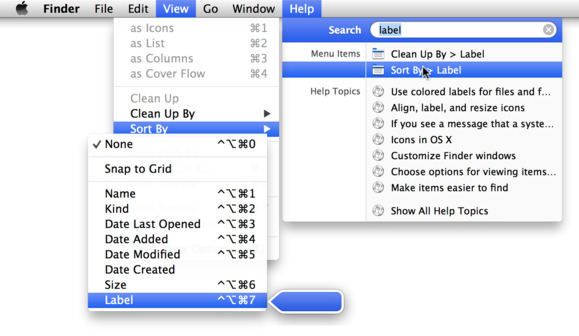 Using OS X Help is easy, but there are some tricks that will help you use it more efficiently. You’ve certainly noticed the Help menu everywhere in OS X: it’s the rightmost menu in every app. The menu that displays when you click on Help may vary from a simple menu with a search field and a menu item to provide help for the current app, to a menu with links to a developer’s website, support page, user forums, manual and much more. 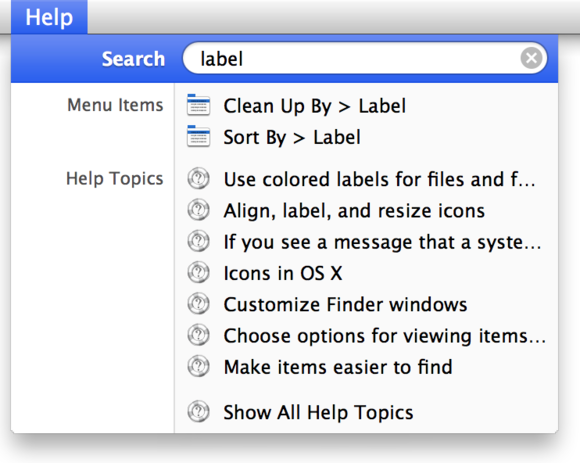 But let’s start with the simplest Help menu: the one you see when the Finder is active. This is the simplest version of the Help menu you'll see. Before delving into Help Center, let’s look at what that search field does. Let’s say you want to find out about Finder labels; type label into the field, and watch as the menu populates with two types of items. The Help menu fills with items related to your search. The first are the various menu items in Finder menus containing the word “label.” Hover over one of them and the menu item you’ve selected will display, with a big blue arrow pointing to it. This help system will lead you to a menu item even if it is buried in sub-menus, as you can see in the screenshot below. In fact, this is the best way to find a menu item when you know it’s in a sub-menu, but can’t remember which one. Use Help to find a menu item, even if it's stashed away in a sub-menu. 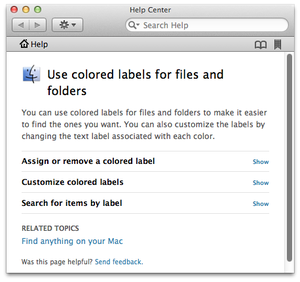 Here, the Help Center window shows a topic about using Finder labels. Navigating the Help Center window is simple. When you see a topic, as in the screenshot above, you’ll often have several sub-topics. Click Show next to one of them to see a more complete explanation. Related Topics may be listed toward the bottom of the window. You can search for anything in the Search Help field. If you click the Help home button (with the house, near the top-left of the window), you’ll be taken to the landing page for OS X help. With judicious searching, you can find what you need in the Help Center. This is the case for OS X, Apple apps, and even third-party apps, if their help is provided through this window. But there are several ways you can make your help-seeking experience more efficient. Change the font size: If the font’s not the right size for you, click the action menu (the one with the gear at the Help window’s top left), and then Make Text Smaller or Make Text Bigger. Save bookmarks: You can bookmark any help topic you want to come back to. Just click the bookmark icon at the top-right of the Help Center window. When you’ve done this, a book icon will appear next to it. Click the book icon to see a list of all topics you’ve bookmarked, then double-click one to view it. View a Help catalog: Lots of apps use Help Center. To see which ones do, click on the house icon at the top-left of the Help window, and then scroll down and click Help for all your apps. You’ll see a list of Recent applications, Apple applications, and Other applications. Click Show all in either of the latter two categories to show all the help available. Help Center is an encyclopedia with help for many of your apps. Use your web browser: Would you rather view help for Apple apps in your favorite browser? Easy peasy. Find a topic you want to view, then drag its link—not its title—either to a browser window or to a browser icon in the Dock. Since Apple’s Help Center’s content is HTML pages on Apple’s servers, that link will open in your browser. (This may or may not work with third-party help.) You can continue navigating in the browser, and shut the Help Center window. You can also save bookmarks in your browser, if you want to come back to help there, and even send these bookmarks by email if you’re providing long-distance technical support to a friend or family member. 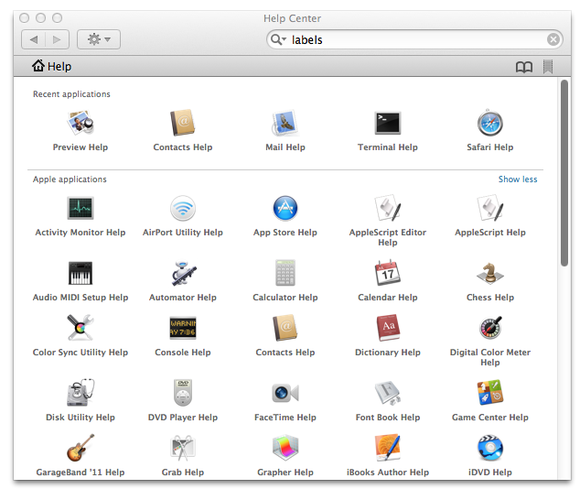 Tweak the Help Center window: One annoyance of Help Center is that its window floats over all your other windows. It’s also a special kind of window that doesn’t display in the Dock, or in the application switcher that you can use to shift from one app to another by pressing Command-Tab. The next time you open Help Center, it will be a normal window. You’ll be able to move it to the background, and switch to it from the Dock, or by pressing Command-Tab. If you want to change it back, run the same command with "false" instead of "true" at the end. Fix a corrupted Help cache: One final tip may help if you’re having problems with Help Center. Help files can get corrupted, or may not display in some cases. If this happens, click the Finder’s Go to Folder menu. Type in ~/Library/Caches, and press Return. Look for two folders, named com.apple.helpd and com.apple.helpviewer. Delete these folders, then relaunch Help Center. As the saying goes, there’s no such thing as a dumb question. If you’re not sure how to do something, take advantage of Help Center. Using the above tips, you’ll save a lot of time finding the answers you need.